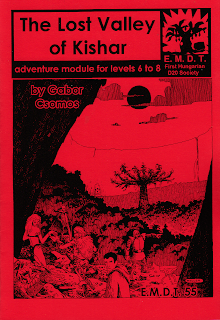 "From Kuroth’s Quill" is grodog's regular design column covering the elements of adventure design (and more-specifically dungeon design, given my interest in that topic). I will also wander through the design of spells and magic items; monsters, traps, tricks, and treasures; PC and NPC classes; planes and pantheons; and likely other topics as well. In the blog, I hope to provide practical examples that will be useful in campaign play, to show theory in action. 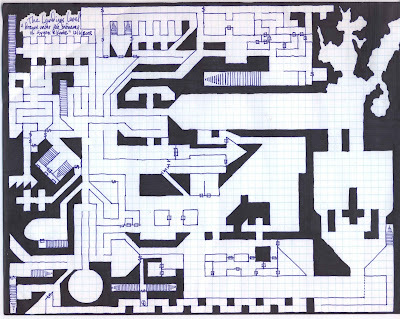 I began this mega-dungeons maps "series" (more consistency in posting would help with that label, I'm sure!) earlier in the year with one of my oldest surviving maps, but that map (and its associated key content) does not reflect the quality of designs that I create today. 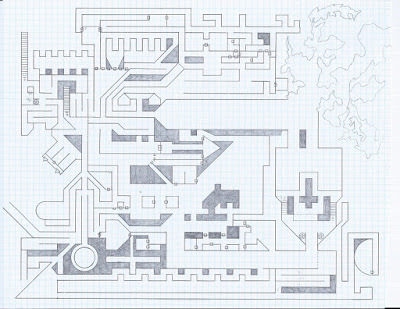 "The Landings Level" map and key more-accurately reflect my current design sensibilities. I created "The Landings Level" map (the first in a group of similar types of maps), over a few days in early December ten years ago, and it marked the beginning of a new phase in my (ongoing) redesign work for my version of Castle Greyhawk. 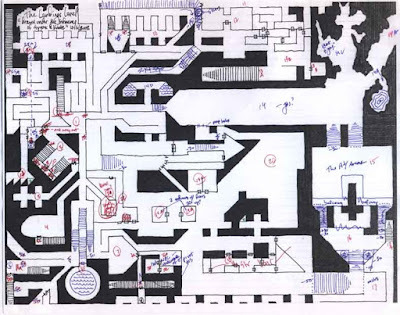 Over the past decade, I've focused primarily on the creation of new levels and keys, rather than an overall structural schema or holistic design guided by a top-down vision for all of the inter-connections between the levels. That approach has its own disadvantages (making the levels fit together into a rationalized, coherent whole is somewhat more difficult this way), however, its primary advantage rests in that during the several years that followed this first map, I've created a pile of new, well-designed levels, many of which I've playtested at GaryCon, the North Texas RPG Con, KantCon, and various smaller gatherings. So, volume of inspiration and creation vs. perfection in overall design won-out, in the short term anyway! The Landings Level was the work that kicked off this phase of creation, and was itself inspired by my research into various unpublished Castle Greyhawk levels, discussions with Rob Kuntz about the Castles Greyhawk and El Raja Key, and my overall engagement with the old-school AD&D online communities at the Knights & Knaves Alehouse, Dragonsfoot, OD&D74, and elsewhere. This is one of the levels that I plan to publish, although it's not the first in line for production. I have been reading so much about this level (in various con report threads) it will be a pleasure to finally read it. :) Thanks for outlining the steps in your design process! Can you tell us something about how you came to do the stocking, or is that for a later post? Would love to explore this! @Melan: I plan talk to the keying process later, Gabor! @Mike: If you're attending GaryCon or the North Texas RGP Con sometime, you may just have that chance! Please be respectful and civil in your commentary. Inappropriate comments may be edited or deleted as dictated by the whims of Balo, Chief Jester and Editor for the Lords of Chaos. 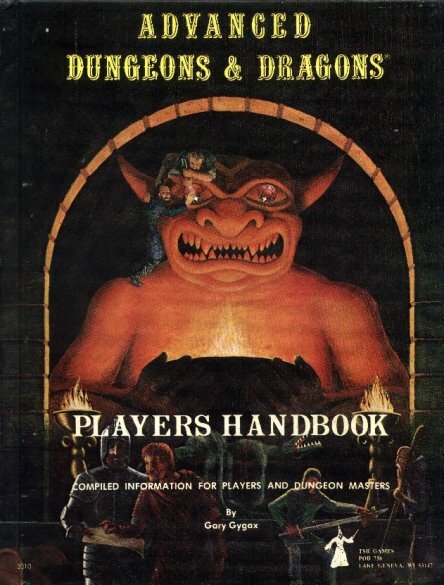 Allan T. Grohe Jr. has been playing D&D and other rpgs since 1977. Allan’s first professional gaming publication (“More for the Shadow Master”) appeared in White Wolf Magazine #11 in 1987; he has also contributed to The Unspeakable Oath, Pyramid, Polyhedron, and Dragon Magazine, among others. Allan co-founded Event Horizon Productions, and has worked extensively with Biohazard Games (Blue Planet, Upwind), Pagan Publishing (Call of Cthulhu publisher of Delta Green), Different Worlds Publications (Tadashi Ehara), and Pied Piper Publishing (Robert J. Kuntz). Allan co-founded Black Blade Publishing with Jon Hershberger in 2009. Allan’s editorial, design, and development work has contributed to winning one Origins Award and securing four Origins Award nominations, winning one ENnie Award and two ENnie Award nominations. 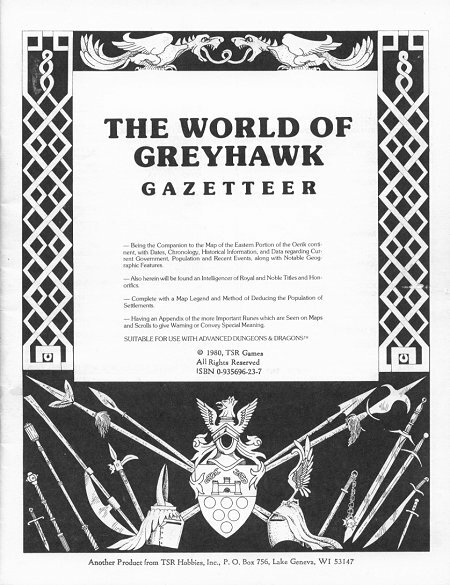 Allan is known online as grodog, where he publishes a website featuring Greyhawk D&D content, as well as his non-gaming writing (poetry, personal essays, and literary scholarship), and the usual fan ephemera. He lives in Wichita, Kansas, with his lovely wife Heather, their two boys Ethan and Henry, and their two pugs Tara and Gypsy. All original content of this blog is copyright by Allan T. Grohe Jr. All rights reserved.. Watermark theme. Powered by Blogger.